I love blue flowers. Yes, I know they aren't as common in blue, but I had blue delphiniums in my wedding bouquet and have been in love with them ever since. Since the pot in this block is green and blue I decided I didn't want to add in any extra colors. You can see in the first two pictures layers two and three. Layer two was the green stem and Layer three was the big blue piece at the bottom of the flower. 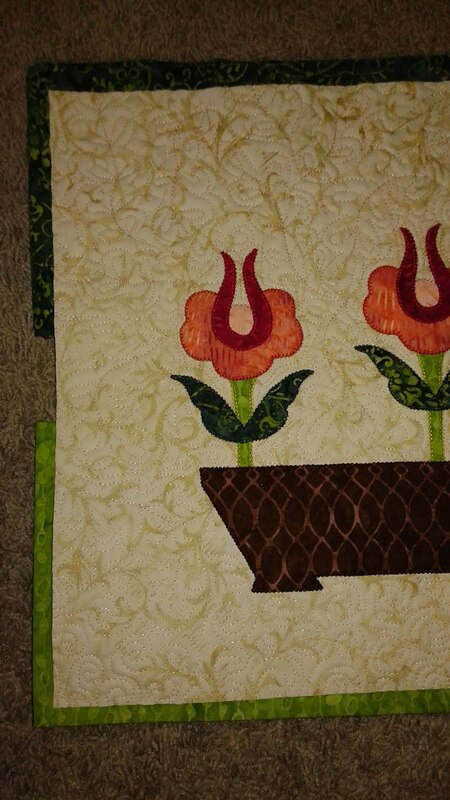 If you look at the photo of the back of the block you can see that the stitching I used for the green stem was quite large. However, I used a blanket stitch that was really small for the bottom blue flower piece. Since the blue piece had such a fun print I didn't want to take away from that with larger sized blanket stitches. You can see here that I used a larger sized blanket stitch again for the second blue flower piece I added. I decided that since the fabric was fairly solid I really wanted the stitches to show up. This was a little challenging around curves, but I'm learning how to make it work for me. I think the easiest thing is to do a wide width (the stitch will come into the fabric quite a ways) and a short length so that the distance between the stitches isn't too great. This makes it easier to turn corners and do valleys. Here is the finished back of the block. Now that its done I can tear away the stabilizer. Here you can really see the different sized blanket stitching I did in the flower. I am really having fun changing up the sizes and plan to do a lot more of it! 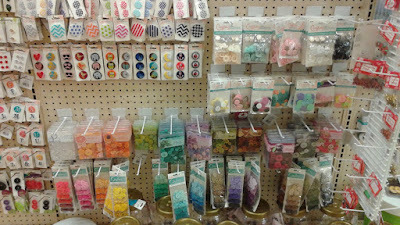 It's just one more way to add more interest and variety to your applique blocks. And here is the final block from the front! 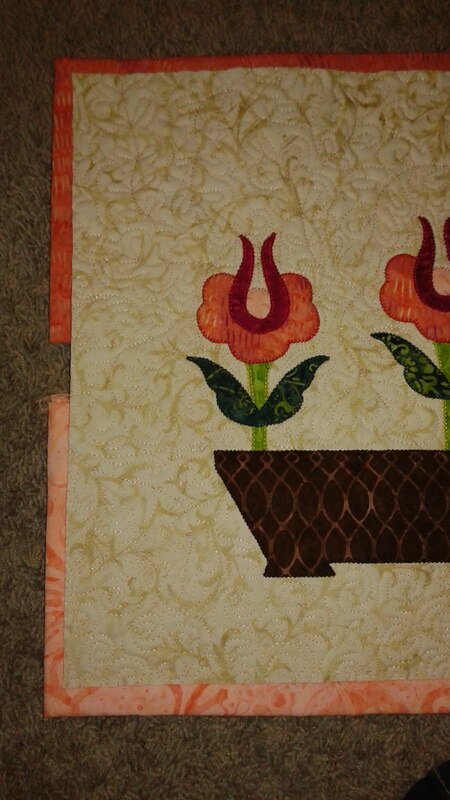 I absolutely love the pot fabric and I'm glad I decided to keep the flower in matching colors. 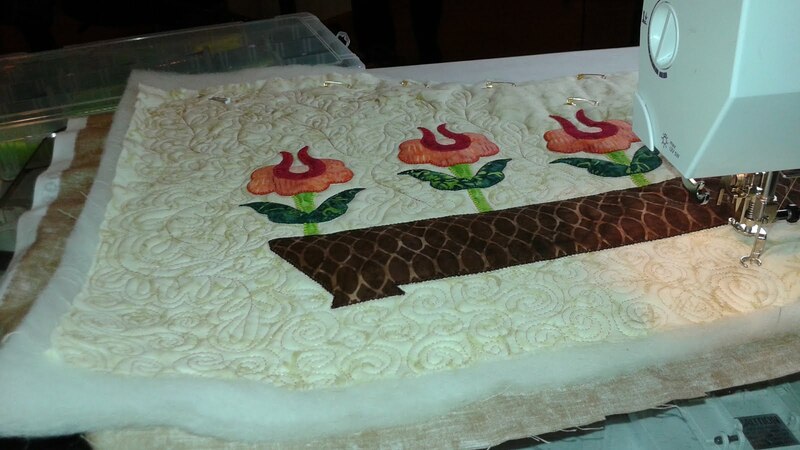 I had to line the light blue piece in the center of the flower with two layers to make sure that the dark fabric behind it didn't show through. This is called shadowing and it's a pain when it happens, so I always think about it when I'm planning my block to try to prevent it. Since I started out with three flowers with large pots and I wanted to hang them next to each other, I decided to make sure that the large pots had fabrics that complemented each other. I ended up with one in orange, one in light blue/purple (blurple according to my son) and one in green. I wanted to use some of my more unusual batiks that would look great in large pieces. It also didn't pass my notice that these are all secondary colors and should obviously go nicely. I wanted to use this fabric for a pot, but I didn't want to use two green ones. Maybe it will be a pot later?! The other thing I wanted to test out was using a LOT of different sized blanket stitches in one block, so I took a picture of the front of each layer AND the back of each layer as I appliqued them. You can see that when I started, I was labeling the size I was using on the back. However, as I kept going I realized that all of this information was going to be lost when the flock was layered, so I stopped writing on the back. I suppose a picture of the back would've been sufficient now that I think about it! There are three different sizes used so far. The tiny wiggle on the pot is a very small stitch. The outline of the pot is slightly larger, but still small because I didn't want it to take over the design of the fabric. 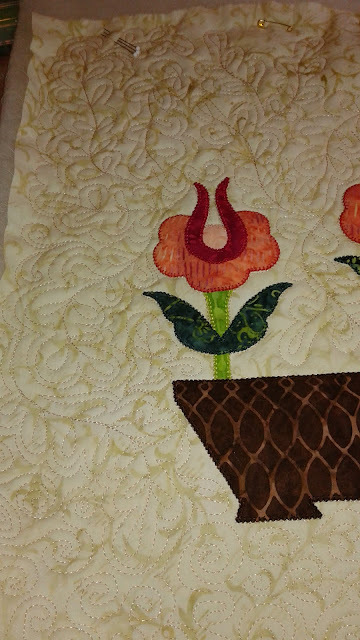 The two leaves are stitched in a very large blanket stitch. Why? Because I'd never done it before! I really like how it accents the leaves. One thing I did learn is that if you're going to go around a curve with a long blanket stitch you really have to be careful or the stitches will go on top of one another. I also decided that while they went deep into the fabric (2.2 mm), I didn't want them that far apart so they are set for 1.8 mm so that the lines into the interior are closer together. I love the fabric for this pot! I've been wanting to use this fabric for a long time. I love geometric print batiks. Here you can see how I changed the size of the blanket stitch for the little wiggle even though I used the same thread. If I would have used the same size stitch you wouldn't have been able to see much of the little wiggle's fabric. That's all I've gotten accomplished, so more next time! 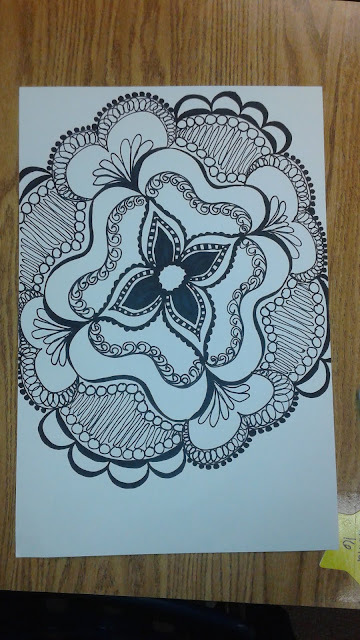 One of my fellow teachers bought me a coloring book that reminded her of my quilting. 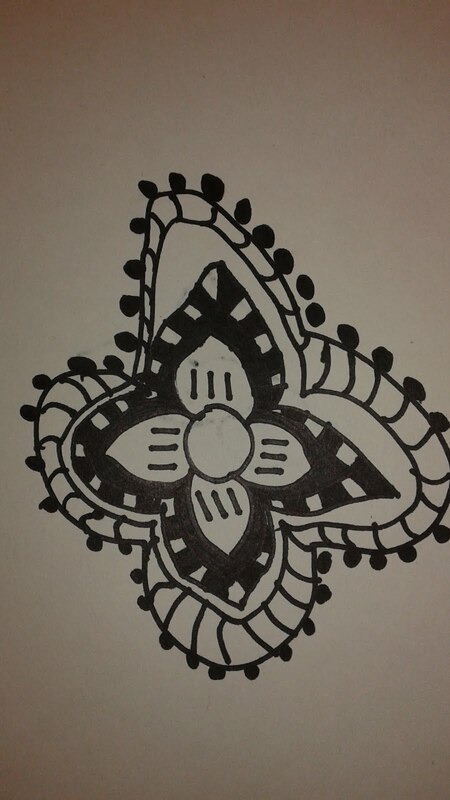 It was on Mendhi design. That same day my students and I were working on coloring covers for our poetry books. 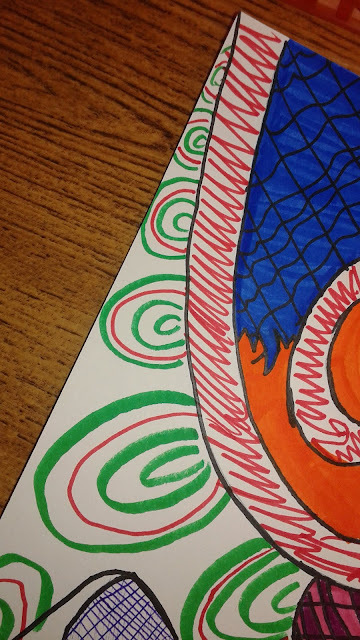 I used some ideas from the coloring book to create my own picture. 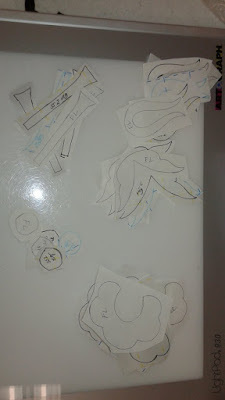 As my students were watching me they came up with some creative ideas of their own. So fun to watch them take off with their own creative ideas! A few weeks ago my sons asked to make quilts. I've done this before with my older son Vincent who is 7, but my 4 year old Roland is new to quilting though he often asks for me to draw him what I'm working on so he can color it in. Now they've both watched me forever, so upon being told yes, my 4 year old ran off to the other room to draw what he wanted to make. 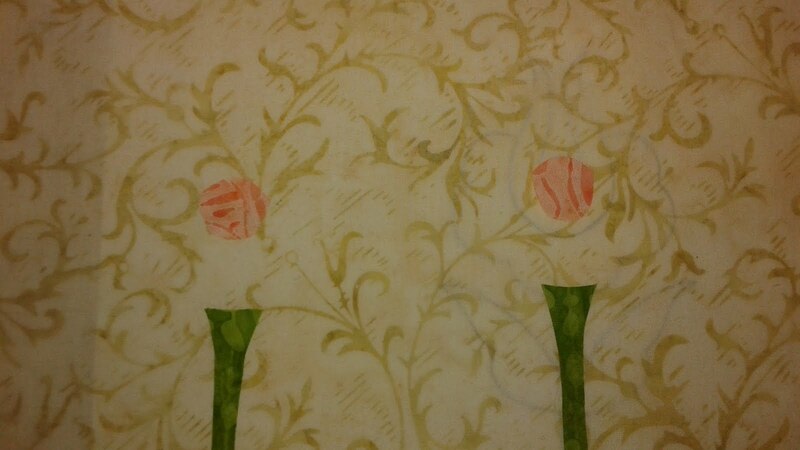 Since I love to applique, these two see me drawing flowers all the time. Clearly, they were inspired to create their own. It certainly made this mama melt! Next, I added backing and a layer of batted and stitched the edge. Then I flipped them inside out and stitched around the edge to hold them together. 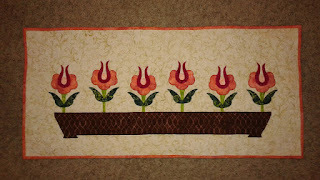 Finally, it was the boys turn to use decorative stitches on the machine to do the quilting. Vincent has used the machine a few times before and was quite happy to quilt away all by himself this time! This was Roland's first time sewing and he was nervous, so he decided I should move the quilt and he would press the pedal. This was how Vincent started too. I can't figure out why blogger won't let me put it in the right way. Another day I'll figure it out. I love this door mat! It's gorgeous and has lots of inspiriting circular designs. Someday I want to do a quilt like this with overlapping circles. 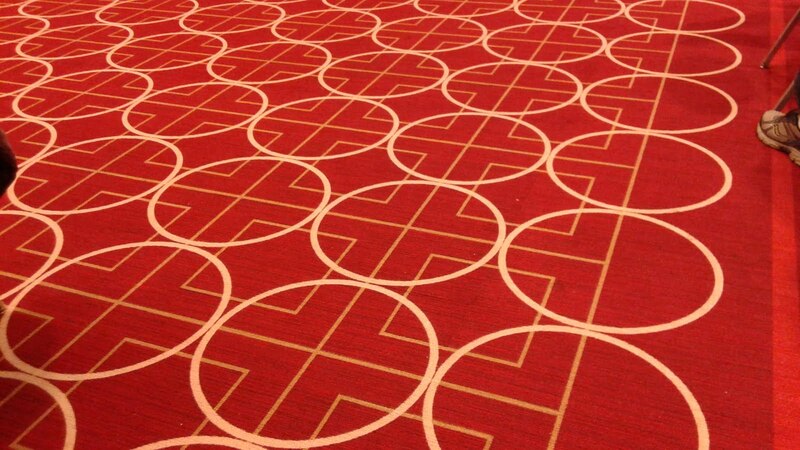 I was at a conference at the Minneapolis Convention Center a while ago and I couldn't resist taking a picture of this carpet. I love the geometric pattern. 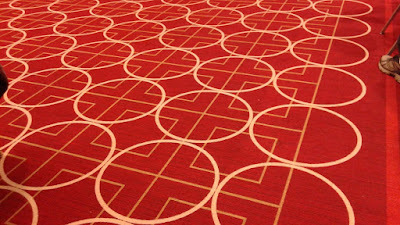 It's only squares and circles and would make a great quilting filler pattern. However, it would be a pain to sew as it's not continuous. I'd have to figure out a way to modify it and make it easier. I love to quilt, but I must admit that quilting large quilts is physically challenging. I am really enjoying quilting the small pieces for my blog. I liked it so I sat down to quilt. After stitching around the snowflakes I realized that trying to put those curls in wasn't going to work because my snowflakes were a lot thicker than the original stars I drew. 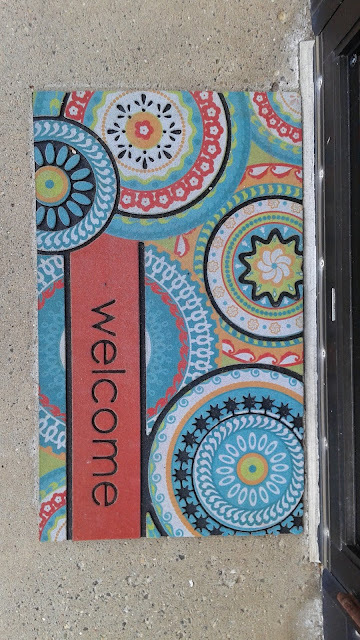 I guess I need to actually work with the pattern when I'm designing...duh. So I decided to just go for it. I did a second outline and then a third and then filled the space with bubbles to match what I'd done in the center of the snowflakes. 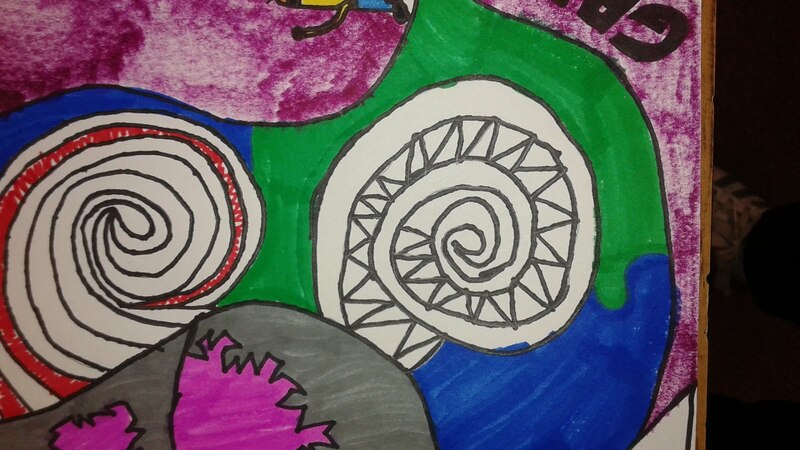 I started with some clam shells and then outlined them and then decided that the lines should come in towards the middle. I hated it. Still do. And then my bobbin ran out. It was a sign that I should be done! It's meant to be used to pick out threads that are under the surface of the quilt top and can be seen and need to be removed. The tip of it is actually the tiniest crochet hook I have ever seen. HOWEVER, I thought it would work great for reaching into those tiny valley to get the stabilizer out since the tip is so skinny. I was so right. It's my new favorite tool for this and it works even better than my awl did. First, I put the awl through the stabilizer to the point of the valley as shown above. Then I pulled the tool up ripping the stabilizer. Sometimes it rips right along the stitching line and sometimes it doesn't. However, now I can easily pull off those small bits of stabilizer. Now that I have this wonderful new tool, there's only one thing left to do: find a safe place for it so I won't lose it and have to go buy another one! I was at Jo-Ann's the other day to buy needles and I turned around and there were the beautiful buttons. I love anything in rainbow colors . And do you see the dot buttons? Love them! And hombre sets of buttons! Too fun! This button is totally a quilting pattern! I love the idea of making flowers like this. 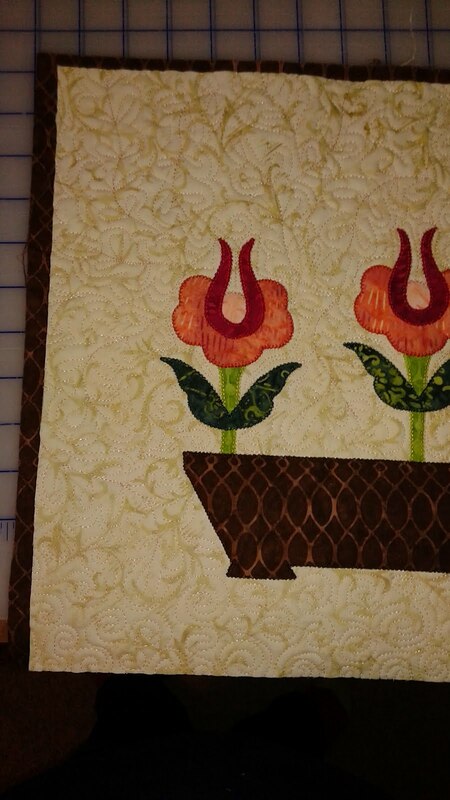 It could even be a filler pattern if you added some leaf design to connect the flowers. I had to buy this button because I loved the flower design. I was clicking through blogs the other day and I ran into Elm Street Quilt's Word 16 Challenge. Since I had already blogged about my word, Future, I decided to go for it and make a mini quilt for their challenge. You can find all the information in the link above. 2. With a quilting book coming out these year I am excited about the future. 3. I am excited about blogging and will continue to do it into the future. So....if you are inclined check out Elm Street Quilt's challenge and pick a word for yourself. When making this table runner I realized an important lesson. When you're working with a large snowflake and you pull all the paper backing off your snowflake it's extraordinarily good at sticking to itself and distorting. It was quite the challenge to get it back into symmetry and stick it to my fabric. I should've put the original pattern on the light box to help line it up but I was being stubborn. You can see from the picture below that the center of the snowflake isn't quite symmetrical. It looks a little squished. The blanket stitch helped with this, but after messing with it for about 10 minutes I decided that it was either cut a new one and put it on a different way or deal with it. I opted to deal with it. To combat this problem I decided to pull off only 2 points of the outer snowflake, stick them down, and then pull and stick as I went to finish putting the snowflake down on the fabric. This method worked much, much better. I decided that since the fabric I used for the snowflakes ranged from turquoise to sky blue to lavender I needed to pick a color that wouldn't clash. Since sky blue was the most predominant I decided to stick with that color. I used a Glide 40 weight polyester by Fil-Tec to do my double blanket stitch. In the two pictures above you can see the snowflake with and without the stitching. 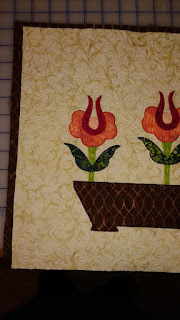 I love how the double blanket stitch really adds an extra design element to the applique. It also makes it look finished to me.